The moment we’ve been waiting for is finally here and watermelon is back in season with its refreshing and super juicy self. From May to September the summer superstar will be our go-to plus one at lakeside picnics, summer parties, and barbecues. But where are these big babies grown? And what’s the secret to picking up the best one? 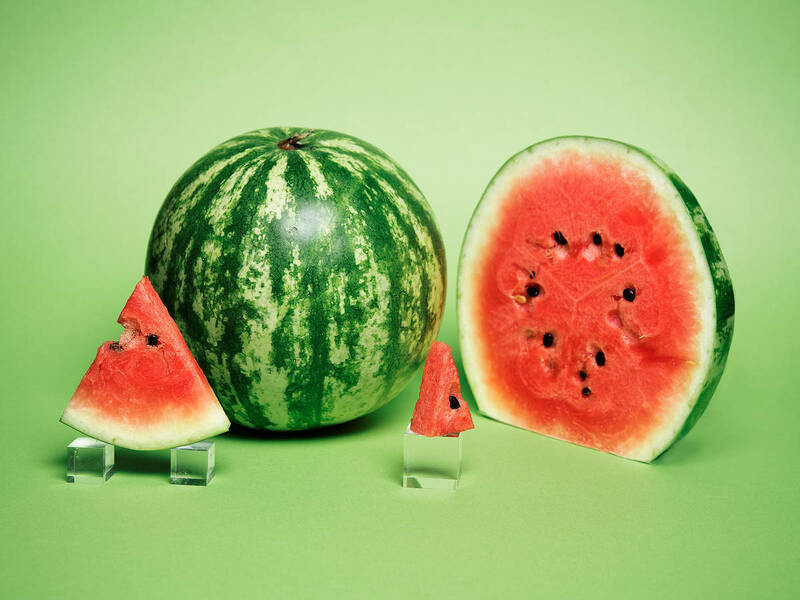 Allow us to guide you through the green and pink world of watermelon. What’s your favorite watermelon recipe? Tell us in the comments below and upload a picture of your most photogenic melon-y creation! Watermelon is the fruit of a vine-like flowering plant that originated in northeast Africa. There are more than 1200 different cultivars of the fruit, which vary in look, size, and shape. From round, square, or oval with dark green, black, or golden rinds and dark red, rose, yellow, or white flesh–they can have seeds or be seedless and weigh from 2 kg/ 4.5 lbs to up to 10 kg/ 22 lbs. The biggest watermelon of the world–listed in the Guinness Book of World Records–weighed incredible 159 kg/ 350 lbs! Although all these different cultivars exist, in commercial supermarkets and farmers markets you’ll most likely run in to just two types: the sugar baby, a round melon with a flawless dark green peel and red flesh, and the crimson sweet, an elongated melon with bright and dark green banded peel and rosy flesh. Both are extremely juicy and sweet in taste when ripe. To be the perfect summer date, a watermelon has simply got to be juicy with an intensely sweet flavor and tender, but not too soft flesh. But how can you find out what hides beneath the thick, strong peel? Our rule is: The heavier the watermelon for its size, the juicier and riper it is. Try comparing two equal-sized watermelons by weighing them–taking home the heaviest one. You can also test their ripeness by tapping upon the peel–listening for a hollow and dull sound. If you prefer buying pre-sliced watermelon, make sure the flesh doesn’t look floury or dry and lacks any dark spots. You can store whole melons in a cool dark place and they will remain fresh for about 2 weeks. Sliced watermelons should be eaten within 3 days, stored in an airtight container in the fridge. If a melon is overripe, with super soft flesh, blend it up into a juice or smoothie! As you might be able to guess, the main component of the watermelon is water–which makes up up to 90 % of the mass! Vitamins and other micronutrients are found mostly in the seeds–which are totally edible. In fact, eating the tiny, black seeds will help you stock up on your vitamins A and C, magnesium, iron, and calcium stores, and not, as myths may be told, result in the growth of an unwanted watermelon in your stomach. However, to support digestion and nutrient uptake it’s recommended to sprout and shell the seeds first. Even with the seeds, watermelon is definitely not a superfood, but it’s a great summer thirst quencher and tasty treat both sweet and savory. With just 39 kcal per 100 g/ ¼ lb it’s also a super light snack! Typically blended into smoothies or as a colorful salad topping, it also pairs well with salty cheeses, grilled meats, fish, and fresh herbs.